This year marks the 60th anniversary of Peeps! Aren’t these anniversary peeps the cutest things? I love the speckled colors — and the fact that they are vanilla flavored, as opposed to just tasting like stale sugar. I didn’t really know what to do with these and decided to make brownies. I figured that most people don’t like Peeps, but most people love brownies! I used a box mix for the brownies because I was short on time. I made a batch of homemade buttercream to look like grass and placed a Peep on top. PS: The only place I’ve seen the anniversary Peeps is at Target. They come in a special silver package with three Peeps in each. 1. Make the brownies according to box directions and allow them to cool entirely. Cut the cooled brownies into squares. 2. Make the buttercream icing and use a few drops of coloring to dye it green. Using a small star tip, pipe a bed of “grass” on the top of each brownie. 3. 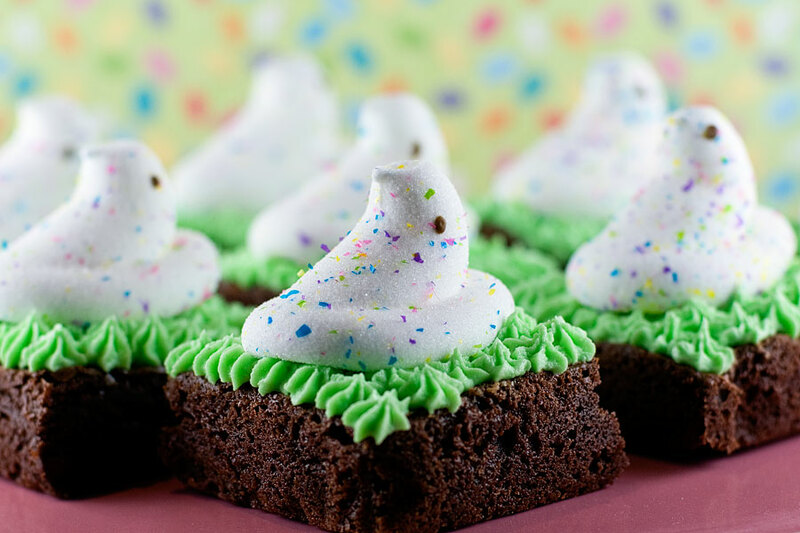 Place a Peep on each brownie. White type of sprinkles did you use?? The colors are so pretty and the sparseness looks really classy. Was it colored sugar?? Also I have never seen a peep that looked like that..Are they just store bought or did you cut some of them off or melt??? ?